We got battered and occasionally woken by heavy wind and rains throughout the night, all the while fearing our plans may be a wash-out. 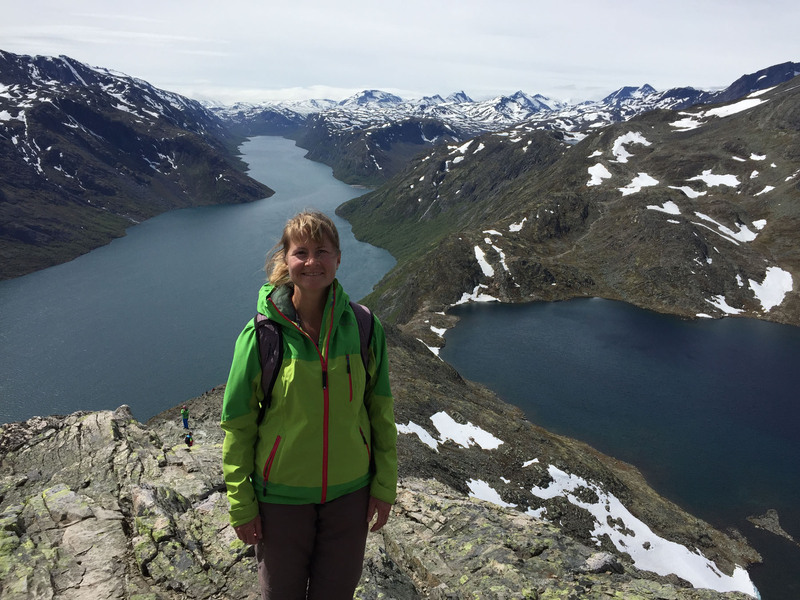 But in the morning we awoke to the vision of a glorious sunburst right across our aire in Beitostølen and the snow-capped mountains beyond. It was the bright, joyous awakening of a very fine day, with blue skies reaching through the gathered, broken white clouds. It felt destined that the sun would burn off the cloud in time and we would be treated to a dry and clear day. 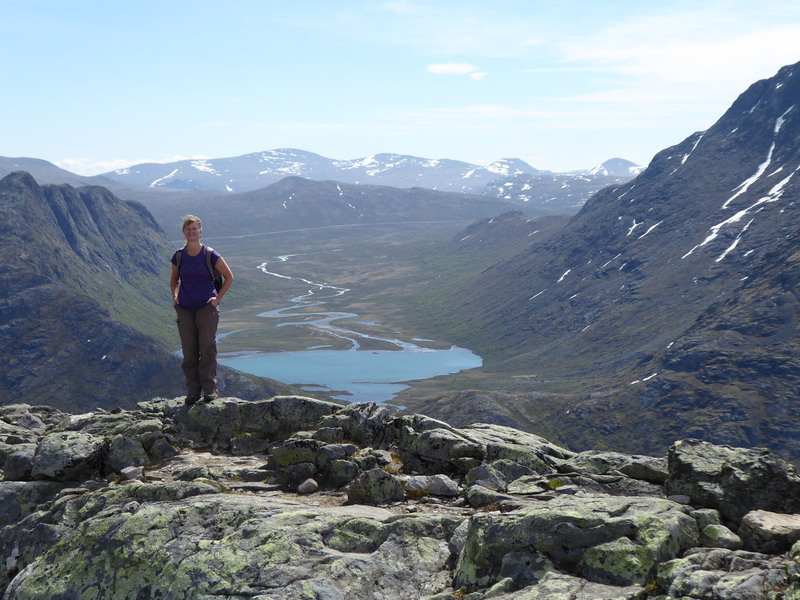 After all the rain we’d had, we couldn’t have wished for a better weather window for our planned trek of the famed Besseggen Ridge. As it was a Saturday morning we had only been able to book a space on the 10.20am boat, the third run of the day, so we had a leisurely start making lunch and readying our gear. We parked as close as we could to the harbour without having to pay their extortionate parking fee, and walked along the road to the terminal. Probably just as well we did, as the car-park was full to overflowing with the vehicles of walkers who had managed to secure tickets for earlier boats. Even with two previous boatloads delivered, there was still a large, colourful crowd of trekkers awaiting, like us, the next boat to Memurubu. 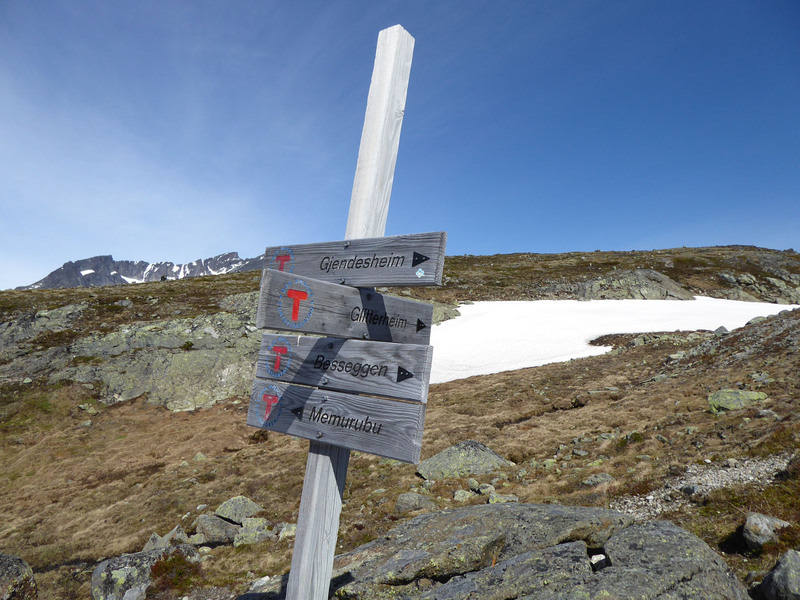 This stop was positioned around halfway along the length of Gjende lake, on the right handside, and was the beginning point for the Besseggen Ridge walk. Our pre-booked ticket worked a charm and the boat was soon off along the lake. 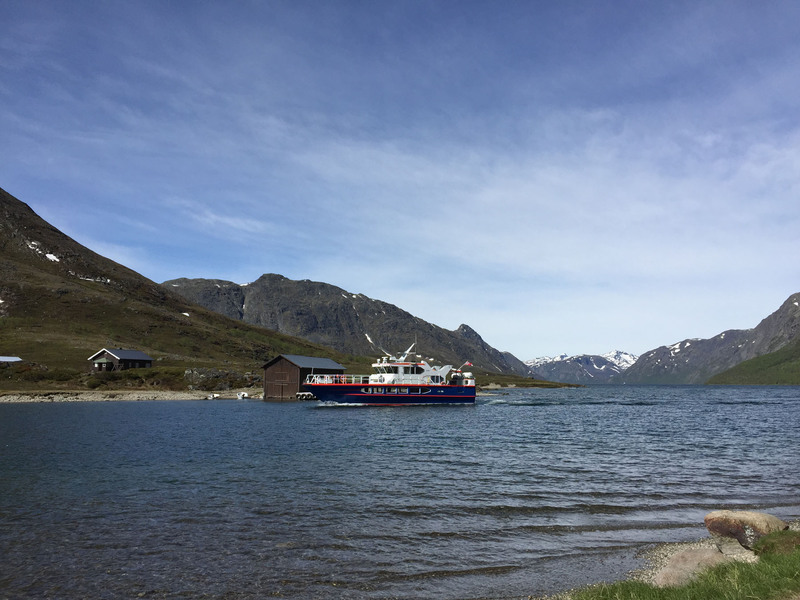 It was incredibly cold on the deck of the boat, with the speed exacerbating the icy winds coming off the glaciers and sliding across the lake at water level. 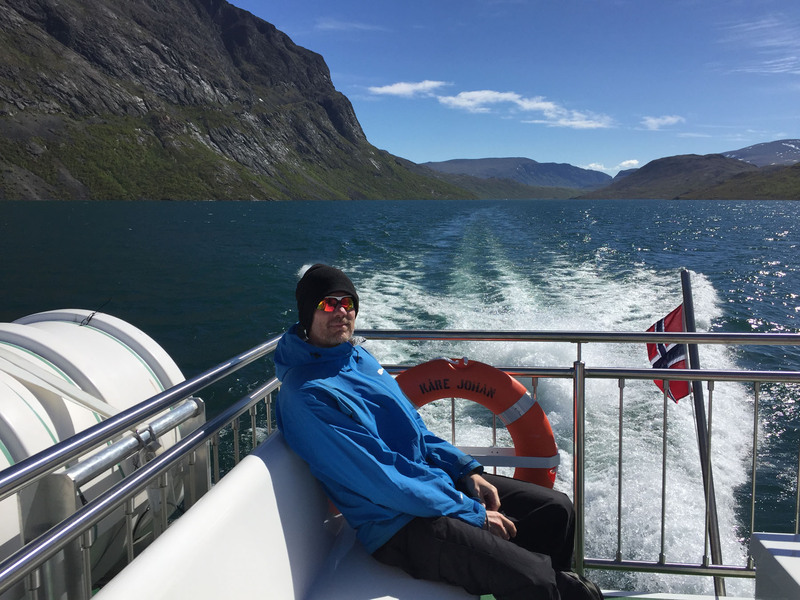 We were initially regretting our limited choice of clothing options, but once we were off the 20 minute boat ride and the walking began, the sun’s heat took over. 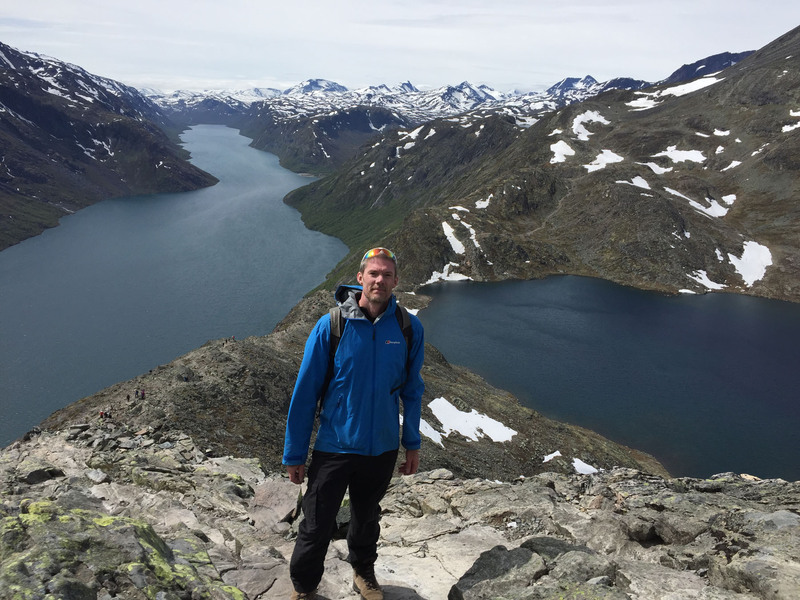 The first kilometre of the climb, up well-built stone steps, was the steepest part and, working hard, we soon had to stop to peel off layers before ascending further. Once up the first steep climb, the ridge opened out onto a wide plateau where we had views of both lakes, inside the mountain range, and below. 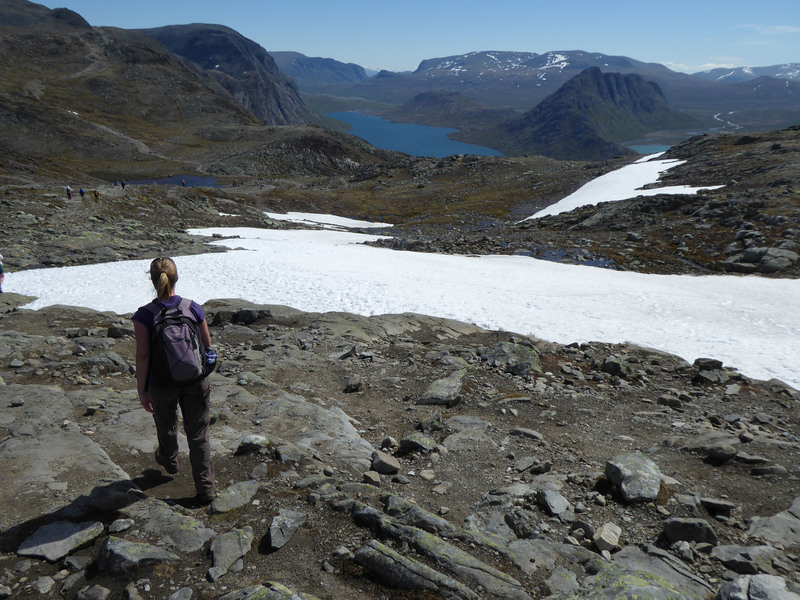 We crossed several short patches of calf-high snow, the routes across quite slippery but well worn. With the sun out and the newly-arrived blue sky as a deep backdrop, the view was simply stunning in all directions; snowy peaks lining the distant horizon, steep mountain walls with patches of snow and trickling waterfalls stood tall over the rippling darkness of the lake below. 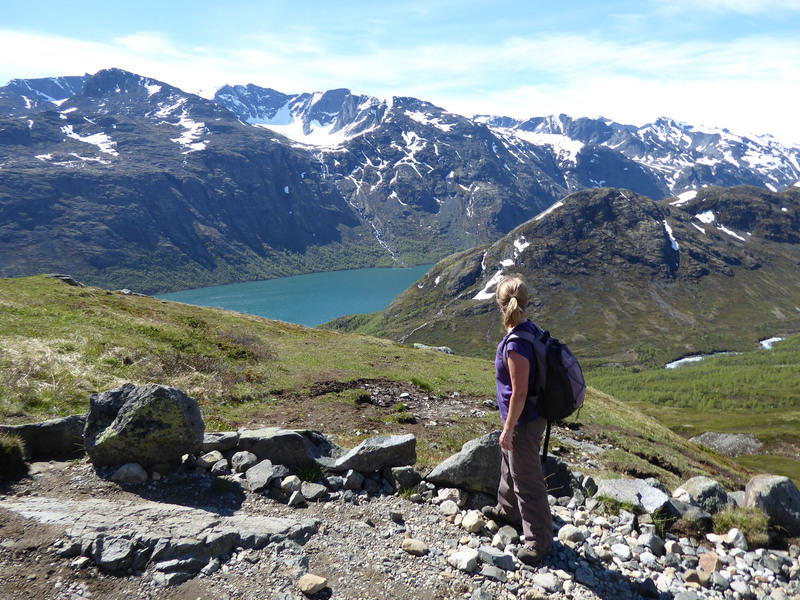 We looked at each other and smiled; views like this were the reason why we love to walk in the mountains. 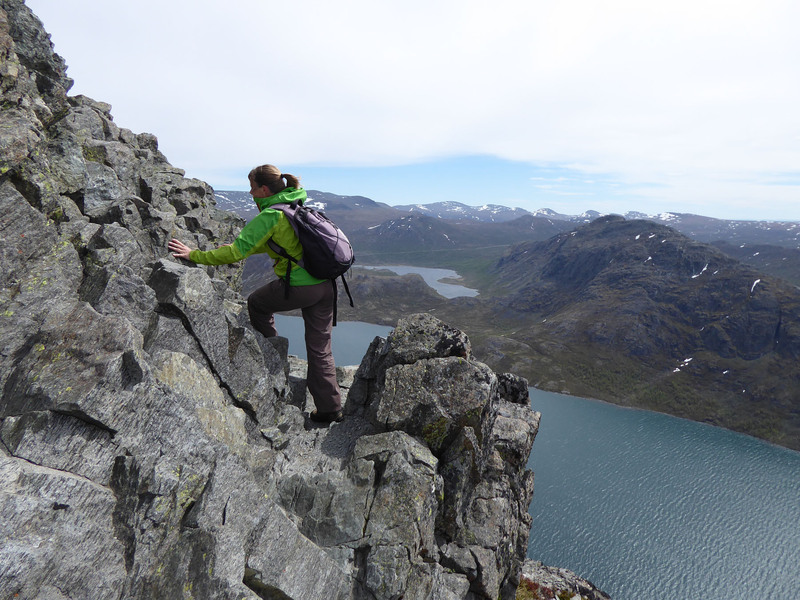 The main challenge of the Besseggen ridge was a scrambling rock climb. The route along the knife-edge ridge was visible from a few kilometres back on the trail, and we could just make out tiny silhouettes slowly making their way up. When we reached the base of the ridge we had to hoist ourselves up, over and between large split boulders using any available handholds we could. This stretch broke up the main trekking a little, allowing for different movements and the working of different muscles. 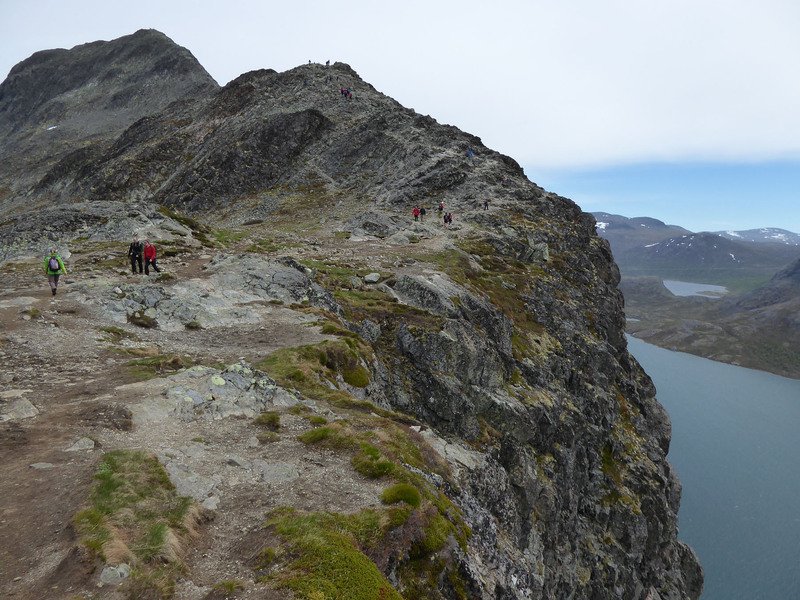 We could see crowds of other walkers clambering around below us like colourful ants as we worked our way up the rock. 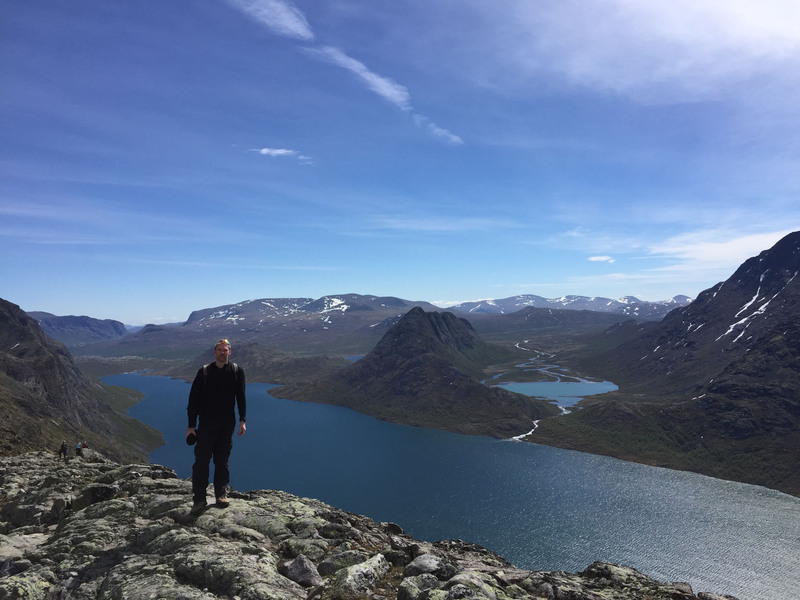 There were several small plateaus where we could rest a while, catch our breath then have it taken away again by the incredible view spread out below us. 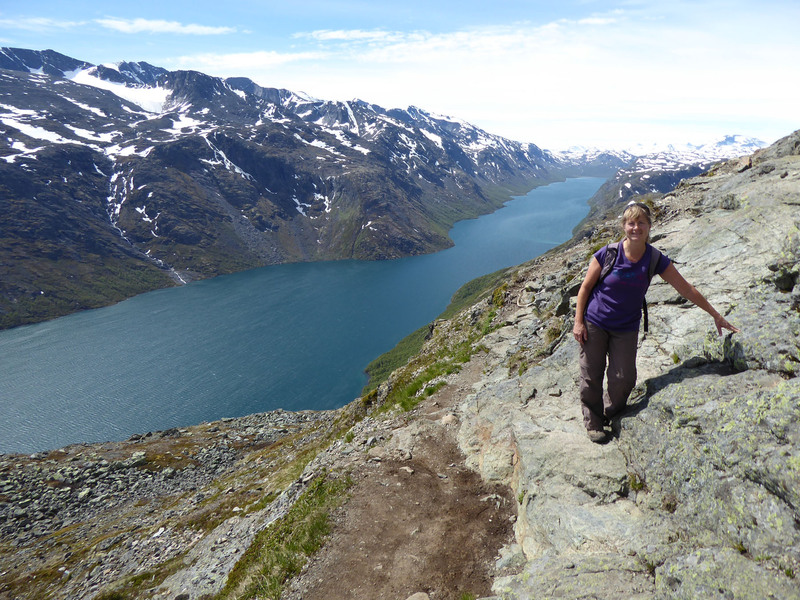 The obviously contrasting shades of green-blues between the visible lakes, Gjende and Bessvatnet, was stark; the consequences of varied levels of mineral-rich glacial run-off. The vibrant greens and yellows of the moss-laden rocks near the summit offered a strong contrast to the icy blues of the lakes. Small white flowers, a type of glacier buttercup, lined parts of the stony track. We learned later they are the highest blooming plant in northern Europe, growing on cold mountain peaks up to 2400m high. 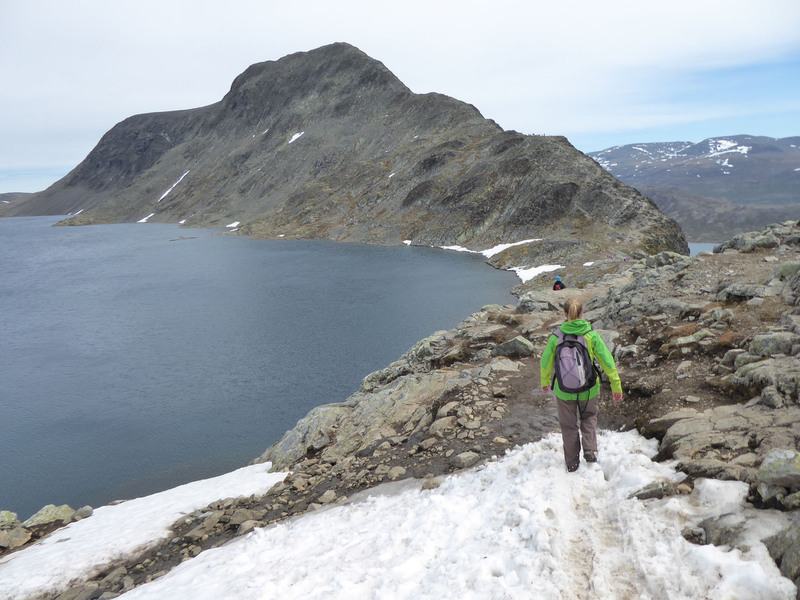 The final summit on the ridge was the huge pyramid cairn at Veslfjellnet, at 1743m, where many walkers had chosen to stop and savour the moment. Shortly after this point, on the descent, we also paused a while near a smaller cairn to have energy-giving snacks and enjoy some people-watching, spotting all the familiar strangers we had been walking near to over the past few hours pass us on the wide, gravelled path leading back home. We continued down the mountain as the weather suddenly decided it had been kind enough for one day. The sky quickly clouded over and the whole mountain dulled down to a washed out monochrome as we stomped along the final kilometres. This last stretch home seemed to drag on and had a few tricky portions, including one smooth granite face that had conveniently been fitted with a thick metal chain to assist descending. The path twisted and turned all the way back, ending with a long run of stone steps that carried us back to the flat entrance road. 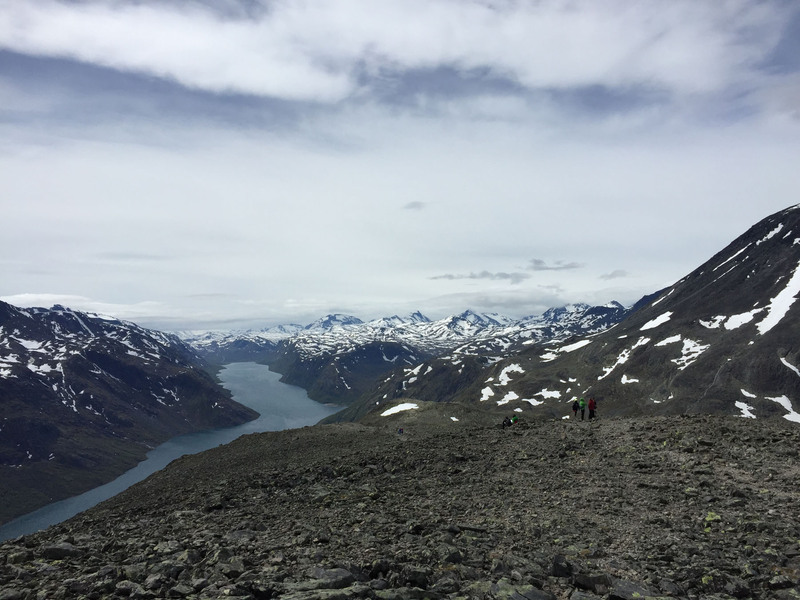 The trail-running record for the 15kms of the Besseggen Ridge route is 1 hour 16 minutes, and it was mind-boggling to us how that was achieved. 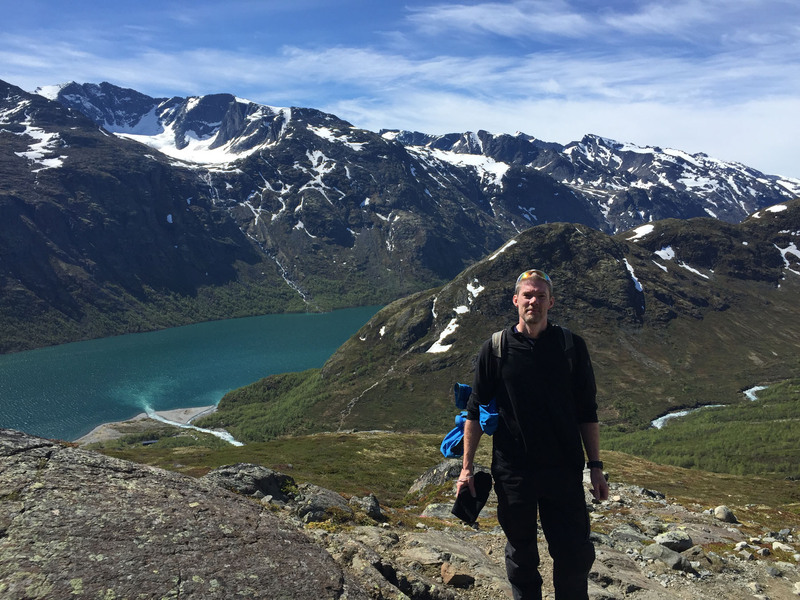 There were long portions of the route that were definitely not runnable, steep up and down near-vertical climbs of high intensity. We considered each stretch as we went along, and though we took just over 5 hours to walk it, we thought a time of 2 hours 15 mins would be a very decent performance given the terrain. To drop another hour off that is just incredible. We’ll certainly not be breaking that record any day soon. Rain started spitting as we walked the road back to Benny, parked in our distant lay-by as we objected to paying 150 NOK (about £14) simply to park for the day at the ferry port. This added an additional 8km to our walk (4km each way) which was already a steep, clambering 15km, but it was a good, flat warm down and leg-stretcher. 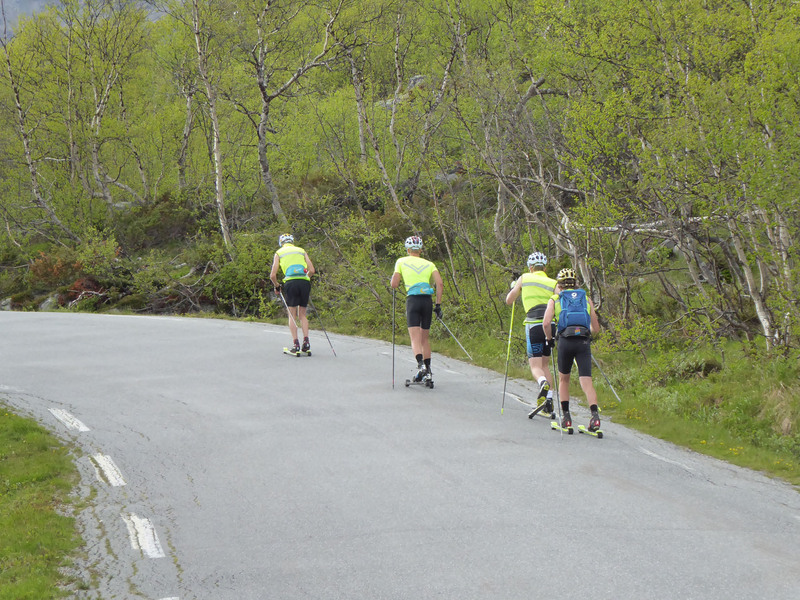 As we walked back we were passed by several groups of training nordic cross-country skiers, scooting along at fine pace on their summer wheels. 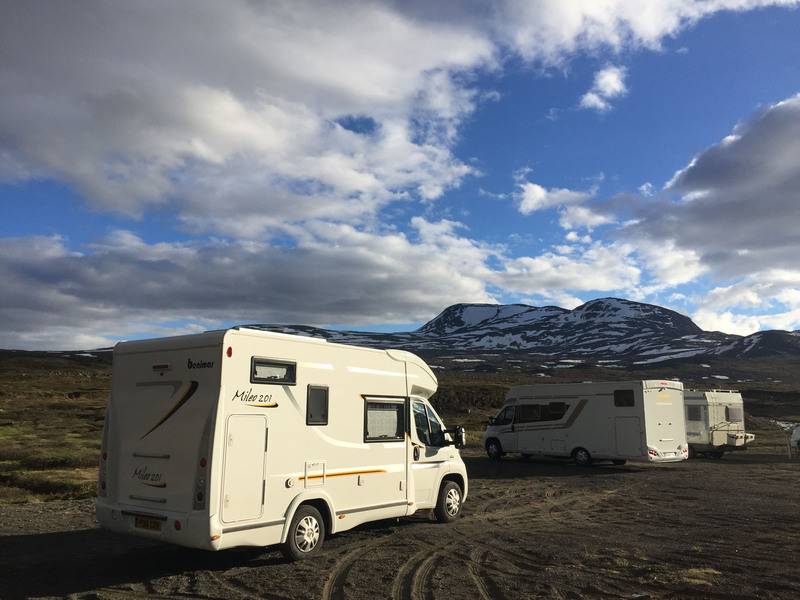 We returned to the same aire at Beitostølen to relax and overnight, where we once again got battered by heavy rains for most of the night. 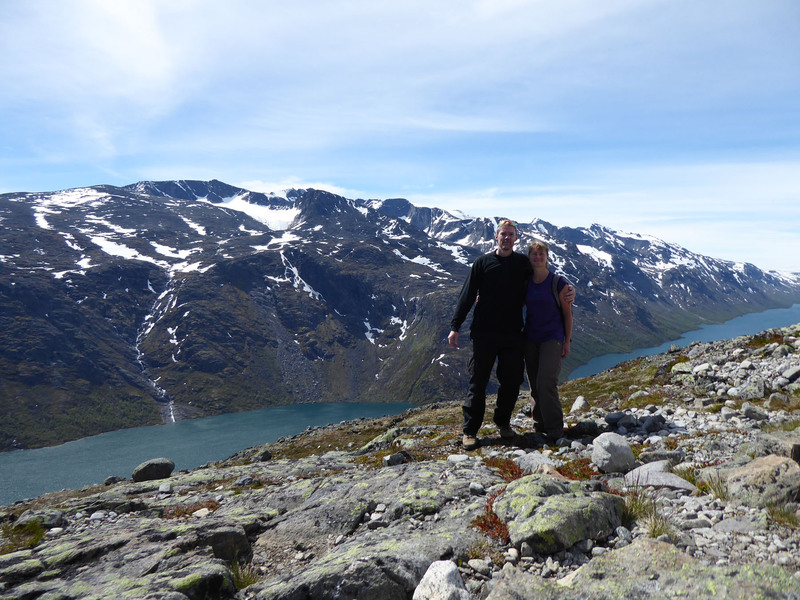 Norway was proving to be a lot wetter than we had expected, but when the weather is fine, there’s simply nowhere better. 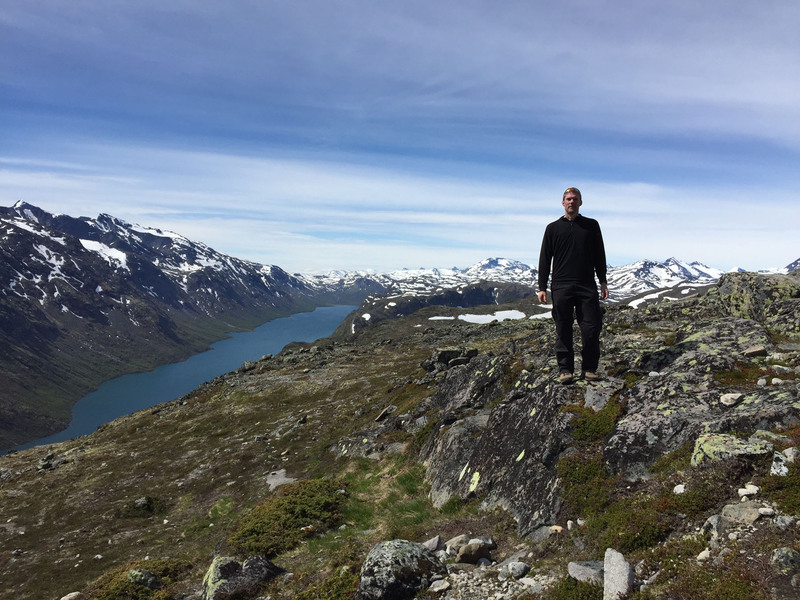 This entry was posted in 2017 Scandinavia Tour, Hiking, In Norway, Norway, Our Travel Journal on Jun 28, 2017 by Aaron Hill.